What is the Best Pet Diet for New Bedford Pet Owners’ Dogs? One of the most complicated aspects of owning a dog is trying to figure out what to feed him to provide proper care throughout his lifetime. Unfortunately, there are a lot of myths associated with pet food that many people believe to be true. That being said, new studies are being conducted all the time that reveal the impact diet has on the health and well-being of our pets, shattering common “truths” about dietary formulas and feeding. Each pet is different and has unique needs that can be met through a combination of diet, exercise, and veterinary care. The best way to determine what diet is optimal for your pet is to visit your local Southeastern Massachusetts veterinarian. Veterinary care in Massachusetts should be multi-faceted, combining annual check-ups, preventive treatments, vaccinations, and trusted advice with emergency services. Some New Bedford pet owners only bring their pets in when they are sick, while others bring them in like clockwork for dental care, regular check-ups, and ongoing services. The same is true with pet diets. 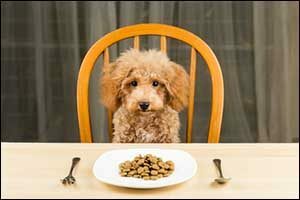 Some pet owners simply provide the same basic kibble that they saw their parents feed their dogs when they were little, while others go above and beyond to cook food at home, purchase raw food diet plans, or spend nearly ten times the average cost of dog food to buy the top-rated dry or wet brand. Unfortunately, both of these choices are usually based on experience, accepted myths about pet food, and cost, none of which will ensure that your pet is getting the best diet for his needs. Your best bet is to visit your local Dartmouth animal hospital and get some real advice from a reputable veterinarian. Many people believe that the name brand foods that cost more or that are purchased through their local vet’s office are much better than anything they can get on the shelf at a pet store or grocery store. The truth is that many of these formulas are more similar than you might think, getting a majority of their protein from by-product sources, grains, and other additives like wheat, brewer’s rice, and corn gluten meal, than from healthy meats. Regardless of how much you pay for the bag or can, the ingredients are typical of poor quality pet food that is made from ingredients that are deemed not fit for human consumption. This can lead to digestion issues, development of allergies and skin conditions, as well as serious health risks, including pancreatic, liver, and heart disease or cancer. Grains are Good for Dogs – The high grain content found in many pet formulas today is a major contributor to allergy problems, obesity, and other health risks. The best food should have meat and a named meat meal, such as beef meal, turkey meal, lamb meal, or chicken meal, as the first ingredient before any grain or vegetable. Even grains, such as brown rice and oatmeal, and vegetables, such as sweet potatoes and spinach, which have been proven to be beneficial, should not come before quality meat ingredients. Dry Food is Important to Dental Health – Another common myth which is sometimes even spread by veterinarians, dry food can contribute to dental problems. Dogs teeth are different from human teeth. They are very pointed, and even their molars are sharp-edged and not flat like ours. A dog’s teeth are designed to bite, chew and tear raw meat. Many dogs simply swallow the kibble whole, or they shatter it to bits with their sharp teeth. It cannot scrape at the base of teeth to scratch away tartar, as many people believe. In fact, if shattered bits get in between the teeth, the dry food can promote bacterial growth. People Food is Bad for Dogs – The truth is, many foods that we eat can be healthy for dogs, but we need to make healthy choices. For example, boiled chicken and ground meats, steamed veggies, rice and oatmeal, baked sweet potatoes and finely chopped fruits can all be great choices for a healthy homemade diet for dogs. Certain foods can be dangerous and downright toxic, so it pays to learn what to avoid. Grapes, raisins, onions, chocolate, and other common ingredients should be prevented at all costs. Raw Food is Dangerous – Many who were against raw food diets now support it due to all the proven benefits that have been seen in this pet diet in New Bedford and beyond. Concerns about E. coli and salmonella made many pet owners immediately dismiss this diet trend, but frozen raw diets and other nutritionally-balanced options have made it easier for pet owners to try this diet out at home. Proper care of bowls, utensils, hands, and countertops after handling any raw meats is key, as is making sure that the raw food is not left in the bowl for more than 30-40 minutes to prevent bacterial growth. Ask your Southeastern Massachusetts veterinarian before starting any new diet plan for your pet to make sure it is the best option. If you have any questions about what to feed your dog or have other questions about veterinary care in Massachusetts, make sure to stop by and speak with our veterinary team. New Bedford pet owners have a lot of options about pet diets and nutrition, so it is important to choose the right diet according to your pet’s needs. Give us a call at 508-996-3731 to speak with our staff or to schedule an appointment for a complete check-up and evaluation.